It has been a hot summer here in San Diego, a great time to enjoy homemade wines and cheeses outdoors with friends. Great easy homemade cheeses to make for summer include chevre, fromage blanc, and creme fraiche - just add direct set cultures to dairy, set overnight and drain the next day. Voilà - you have fresh cheese! Add fresh herbs for a yummy spread or dip, or mix with pasta and garden vegetables for a fresh summer supper. 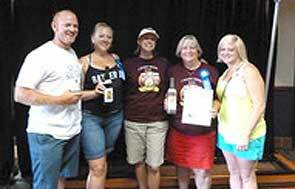 Congratulations to all of the homemade wine and cheese contest winners at the 2013 San Diego County Fair! It was a great contest this year, with 373 wine entries, including a total of 94 gold medals, 131 silver medals and 81 bronze medals - at least 54 of those medals went to wines made with wine kits! 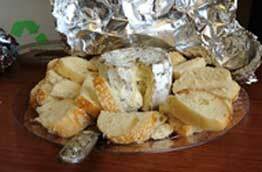 There were also 35 homemade cheese entries, with 5 categories judged. The Best of Show cheese winner was our very own customer Jackie Fuhrmann-Clower, who won with her lovely and creamy cambozola. 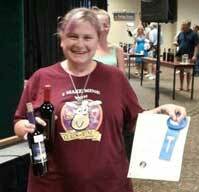 Congratulations to Jackie for all of her awards, and to everyone that won awards at the Fair this year! We hope to see many more customers at the awards ceremony next year -- especially you cheesemakers!! Now it's time to get serious about preparing for wine grape harvest season. Curds and Wine has everything you need, including a Basic Winemaking from Fresh Grapes Crash Course if you missed our more extensive winemaking seminar series. We will again be a pick-up point for West Coast Grapes fresh grape deliveries, and this year we will have a special drawing for a free bucket of frozen juice -- see details below! In case you missed out on our comprehensive Basic Winemaking from Fresh Grapes 3-part seminar series, we have a special Basic Winemaking from Fresh Grapes Crash Course on Sunday August 11th or Friday August 16th from 1-4 pm. 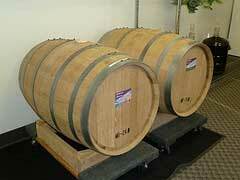 We will cover the basics of making wine from fresh grapes. We will go through the processes involved, chemistry testing, and the equipment you will need, with demonstrations of the use of equipment commonly used for winemaking. Purchase of fresh grapes or winemaking on site is not included; grapes must be purchased separately and wine made at home from fresh grapes. No wine is made in this class! Must be 21 or over to participate. No refunds on ticket sales. If you are interested in being part of our 2014 Grapes to Glass or Hands-on Harvest courses, please contact us. We already have a waiting list for next year's harvest! In association with San Diego Amateur Winemakers' Society, Curds and Wine will be hosting bi-monthly home winemakers' seminars. These seminars are held every even numbered month on the third weekend at 1 pm. Seminars are given by Lum Eisenman, a winemaking guru that we are lucky to have in the San Diego area. Lum will share his expertise on various winemaking techniques and issues. This month, just in time for harvest season, Lum will give discuss "Must Adjustments". 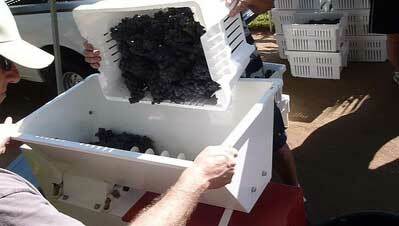 We will help you get some fresh grapes for your home winemaking this harvest season. 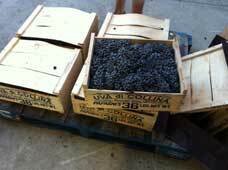 We will once again be a pick-up point for fresh grapes from West Coast Grapes, You can order your grapes online. Grapes will be purchased directly through West Coast Grapes, we will be a pick-up point only, no sales on site for these grapes! We will not store these grapes, they will start spontaneously fermenting if you do not pick them up the day they arrive. You will be notified by West Coast Grapes when the delivery is expected, last year they arrived in October, but it could come some time in September depending on harvest this year. 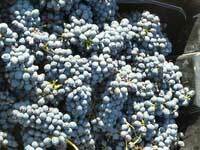 We will have a crusher/destemmer available to run these grapes through for a $25 processing fee for up to 500 lbs, another $10 fee for every additional 500 lbs. As a bonus to Curds and Wine customers, we will have a drawing for a free bucket of frozen juice from West Coast Grapes! For every box of fresh grapes you purchase from West Coast Grapes to be picked up at Curds and Wine you will get one drawing entry. Please send us a copy of your purchase receipts for the drawing; the drawing will be held 2 weeks before the pick up date (to be determined, typically end of September or early October). Only submitted entries will be part of the drawing, West Coast Grapes will not be providing us with a list of customers. If you win you will be sent a coupon to redeem with West Coast Grapes to have your bucket delivered with your grapes to be picked up at Curds and Wine. We also of course have all of your harvest supplies available a well as equipment rentals, such as must pumps and presses. Please note: only grapes delivered from West Coast Grapes can be processed on site at Curds and Wine, all other processing must be done off site and equipment returned clean and in working order. We do not offer any winemaking on site with fresh grapes except our Hands-on Harvest and Grapes to Glass courses. These courses are sold out for 2013, but if you are interested in getting on the waiting list for next year please contact us. You can never have enough hydrometers during harvest time - without fail they break in the middle of the night! Order $100 or more in supplies from Curds and Wine online, get a free triple scale hydrometer (applies to online orders only, for in-store pick up or to be shipped). Enter one triple scale hydrometer in your shopping cart (item #123), then enter coupon code HARVEST2013CAW at checkout. One free hydrometer per $100 online order, does not apply to in-store purchases (but can be picked up in-store). Offer expires 10/31/13. You can find all of your harvest and fermentation needs at Curds and Wine! We now carry Assmanshausen (AMH), Rockpile (RP15), and QA23 yeasts. You can find a complete list of yeasts in stock on our website. For your fermentations, we have a variety of nutrients and enzymes available. In addition to traditional pectin enzyme, we also carry and Lallzyme EX-V to enhance your red wine macerations to increase extraction and stability of tannins, color, and flavors. We also have several malolactic bacteria strains available, including VP41, Enoferm Alpha, and White Labs liquid malolactic bacterial culture, plus Opti-malo plus nutrient for a healthy, complete malolactic fermentation. We have a great red wine making summary and basic shopping list available online to help you find everything you need for your fermentations.